...a lot! We brought you 5 days just bursting with colorful inspiration! I'd invite you to "rewind" through our hop, I know you'll be inspired when you find out how many ways you can combine stencils and products from Ken Oliver Crafts! You can start here to see what we did! And, make sure to leave a comment or two along the way...we have some prizes up for grabs and we're keeping the contest open though Sunday (March 29th) night! I think you'll go wild when you see what we've done. 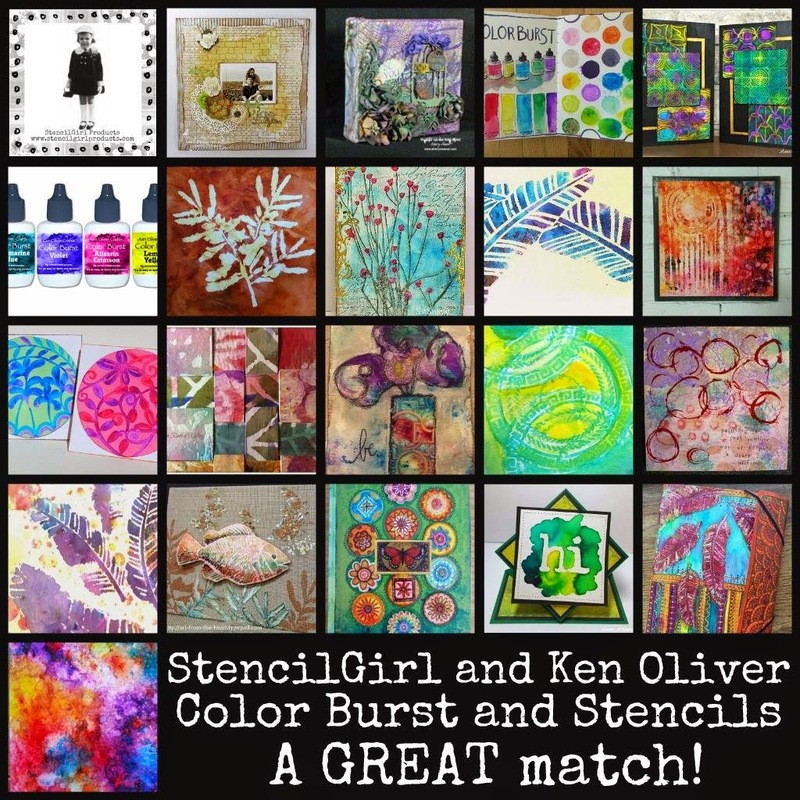 Thank you again for visiting our blogs this week and I hope that you'll be inspired to create something wonderful with Stencil Girl Products and Ken Oliver Crafts! We have a crafty haul of prizes, just leave a comment below and on the blogs you visit, and you'll be eligible to win! We're keeping the contest open thru Sunday evening...so you can still leave comments to be eligible for the prize packs! Thank you again for looking in our creative adventures this week! I saw all the projects you are doing for art on the edge. Love it all!!!! Ken, this was a wonderful blog hop and intro to your products. So much inspiration and something for everyone. I met you in Plano TX stamp show but you were out of all but green. I am in love with these. It was a great hop. The projects were amazing. I thoroughly enjoyed seeing everything. Can't wait to get my hands on the Color Burst. The Click-it were also new to me and I'll be checking those out as well. I really enjoyed the hop, must order your ColorBursts, as they add such vibrant color to your work! I can't wait to win, I'm so excited to use these wonderful projects. Thank you. Oh, happy day! I was one of the lucky winners of a paper pack! It's gorgeous. I can't wait to use it. Thank you so much.